Since 1976, the United States has recognized November as Native American Heritage Month. Each November, the city and county of Los Angeles celebrate the culture, contributions and heritage of Native Americans. 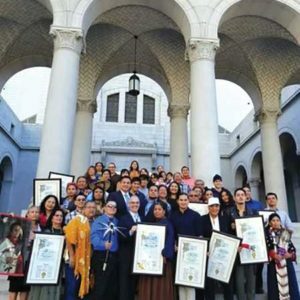 On Nov. 2, the Los Angeles City/County Native American Commission and Los Angeles City Councilman Mitch O’Farrell, 13th District, kicked off the 2018 American Indian Heritage Month by honoring the 2018 American Indian Heritage Month honorees at Los Angeles City Hall. Jointly, the commission and councilman honored 12 honorees: Glenda Ahhaitty (Cherokee), Harold Freeland (Navajo), Henry and Lucy Hale (Navajo), Toni Hawk (Cheyenne), Votan Henriquez, Adai Lamar, Levi Ponce, Jacob Pratt (Dakota and Ojibway), Taboo (Shoshone), Pat Vegas (Yaqui and Shoshone) and his son PJ Vegas (Yaqui and Shoshone). Henriquez, Lamar, Ponce, Pratt, Taboo, and Pat and PJ Vegas were recognized for their contributions to the inaugural Indigenous Peoples Day Celebration in Los Angeles, as well as their contributions in their respective fields of arts and music. This year’s commission-selected honorees were Ahhaitty, Freeland, Henry and Lucy Hale, and Hawk to recognize their contributions to Los Angeles’ Native American community. The honorees and their families will be honored again at the commission’s 2018 Pow Wow at Grand Park on Nov. 17 at 5 p.m.